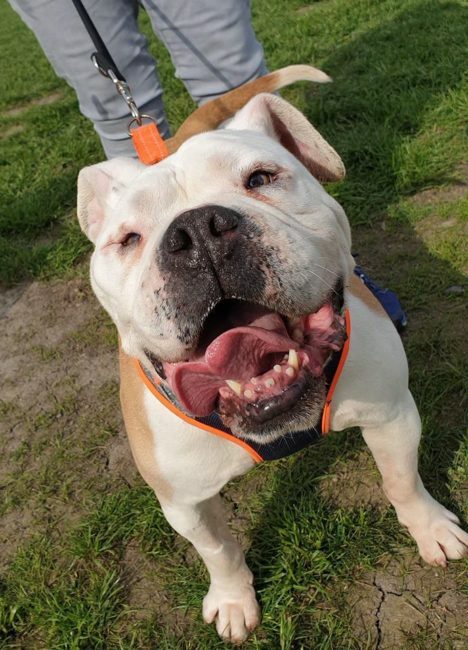 Lovely Lissie the American Bulldog is such a big softie! Lissie is 3 yrs old and is really friendly, just a little bit daft and very loving! 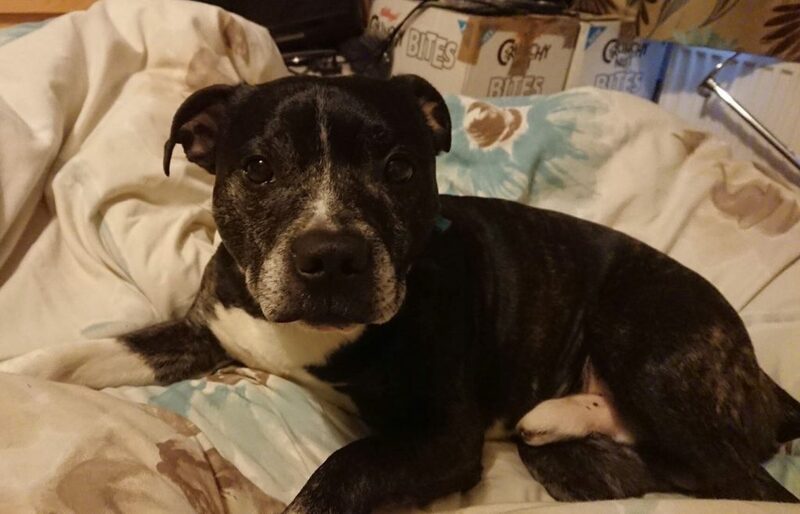 She has been spending weekends out of kennels in a home with one of our volunteers and has been the perfect house guest – she is fully housetrained, learning to sit and wait, loves to snooze in a comfy bed after a good walk and is just great company. Once settled, she will be fine to be left for a few hours, and will probably just snooze as she is quite lazy once she’s burnt off her energy on a walk! Lissie can be very strong on the lead at times, but is getting better and better, however she does need someone strong enough to walk her (especially if she spies a squirrel!). She travels very well and loves being in the car!. She has generally been really good meeting other dogs out and about on her walks, and seems best with dogs around her size, younger dogs or slightly smaller dogs. She can actually be quite sensitive, and can be easily spooked by loud noises or sudden movements, sometimes she will flinch and cower down which might be a sign of her past experiences, she never shows aggression, she can just get scared, and may have a bark at things that are new and make her jump (a food blender was very scary at first!). She will also have a bark if she hears a knock on the door etc, but isn’t much in the way of a guard dog as she just wants to kiss visitors to death!! 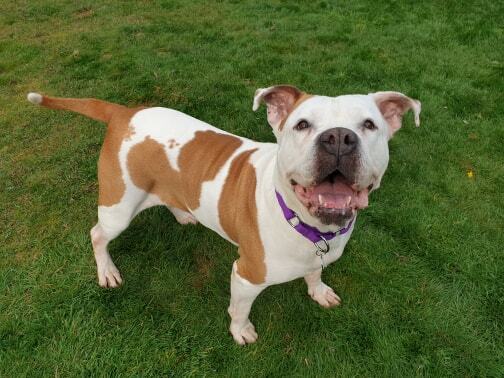 We are looking for a calm, quiet home for Lissie, she is on best behaviour when things are kept nice and calm for her as she is very easily over excited. 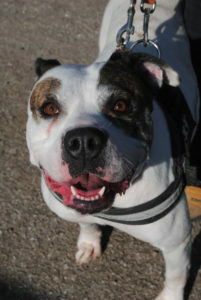 Ideally a home with American Bulldog experience would be perfect, but not essential as long as you have some large breed/ bull breed experience. Lissie will be the most loyal, loveable companion for her lucky new family.